Chic; originally a French word is very prevalent in my vocabulary and I am often drawn to a space or outfit because of it's chic-ness. The word chic is defined in the dictionary as follows: casual and understated style, as in dress or décor, that expresses a specified trendy lifestyle or activity. This California Beach house featured on the pages of House Beautiful magazine has both rustic and traditional pieces making it not only comfortable but chic as well. This dreamy 1,650 square feet property may be small in size but due to good design can sleep twelve comfortably. Each room has been built to make the most of the space and often do double duty. In the dining room a banquette, with more storage underneath, doubles as a guest bed. The space is also packed with great interior design ideas that can be accomplished on a modest budget. The kitchen while limited in size does not lack in functionality or character. 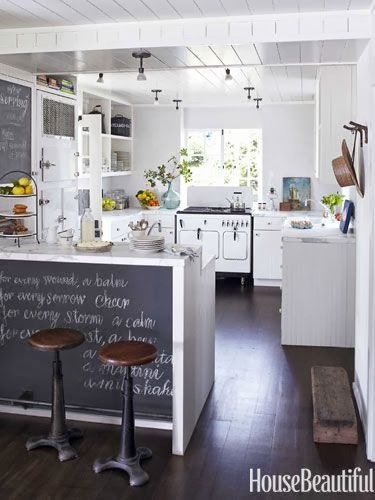 The vintage stove feels right at home in the space and the unlikely located chalkboard on the breakfast bar serves as an opportunity for a to do list or encouraging quote. Mirrored closets, a high ceiling and white paint in the master bedroom expand the sense of space. 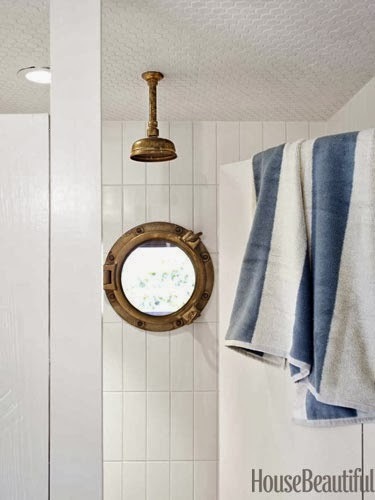 Details throughout the house such as the porthole window in the bathroom and Waterworks shower head add interest to the home. See more of this property and get more interior design ideas visit House Beautiful or by following along on Pinterest. All images via House Beautiful. You doing a great help us to sharing the information about these all buildings..You were seriously doing a amazing help after share this post,so thanks for this or keep update more.. Thanks for Sharing the useful information with us, Your interior design ideas are so good, you are really doing a great job. I love these type of interior design ideas and implement in future.